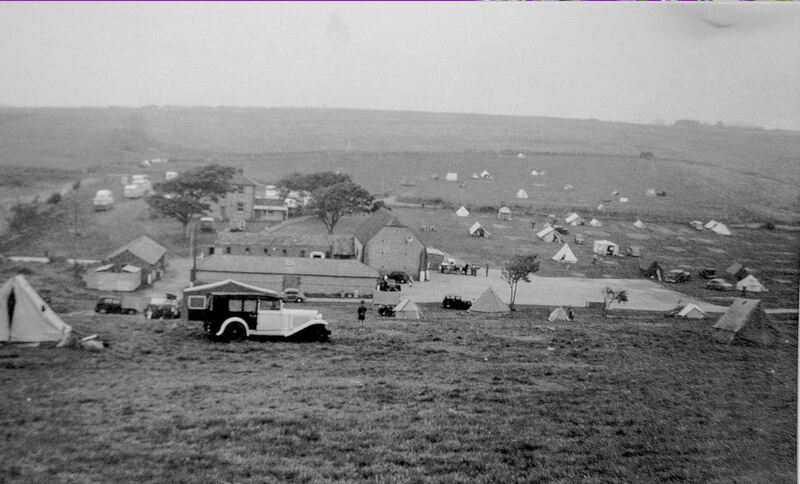 Those cars look older than this – and I am not informed enough to decide whether or not it is Sheepcote Valley. No doubt, Sheepcote Valley, one of my childhood playgrounds in the 40s and 50s, many happy hours spent there. I think Sheepcote Valley viewed from Roedean Road, Wilson Ave would be to the left just out of view. Looks earlier than 1955, well the car does! It is Sheepcote. The two sets of buildings in the image are described on a 1950s street map as ‘Camp Office’ and the ground plan on that map is identical to those in the image. I should know the farm name…but cannot find it right now! [Andy will know it for certain]. The vehicle in the centre is, to use a long ignored term, a ‘shooting brake’; I do not know the maker but I had it in the 1950s as a Dinky Toy. The car on the right, by the white tent, looks more modern than the other cars parked on the site. This could be Sheepcote Valley, looking north, with the houses in Hillview Road (next to Warren Road, Woodingdean) on the right horizon. I am sure this photo has been published before and I may have posted a comment. I think the 1955 date is about right as there are several post War cars shown including a c1953/4 Morris Minor, a Vauxhall Wyvern c1953 and to the extreme right what seems to be a similar era Standard 8 or 10. However my main interest was the Bentley Shooting Brake shown in the centre nearest to the camera which appears to be a 4-1/2 or 6 litre dating from 1926 to 1930. Not many of these were fitted with that style of coachwork and I can’t put my hand on a picture of a similar one at the moment. Of course many of these were later re-bodied with more sporting bodywork as befits the marque. I wonder if it survives today? As to Sheepcote Valley; There was a dump of ex military vehicles there until the early 1950s but whether it is there or not I really can’t be sure. The Downs behind look about right though. It is definately Sheepcote Valley taken facing west (Whitehawk will be over the hill). The house hidden behind the trees was the original farm house and became the residence of the couple in charge of the caravan camp. The city dump is out of view to the left of the picture. I lived on the site from 1945 to 1954/55.